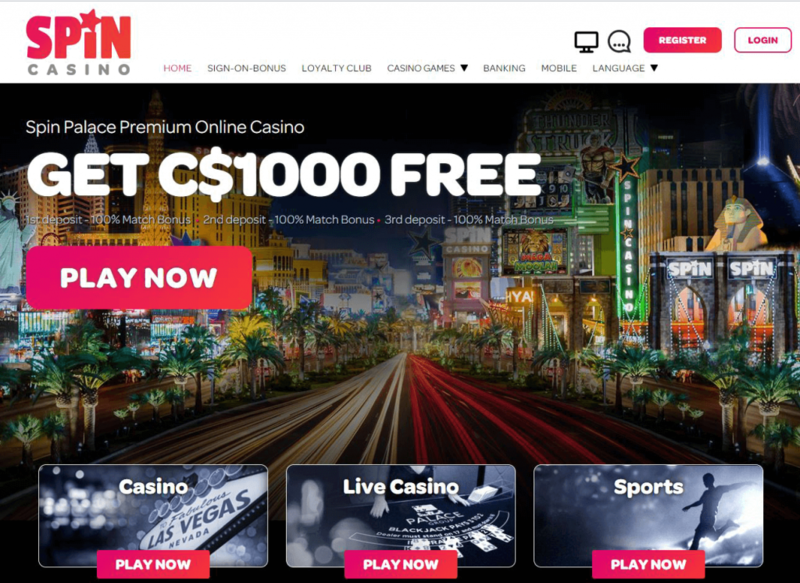 When you hear the name Spin Casino it immediately conjures up images of slots, but at this online casino there’s actually so much more to enjoy. Slots may take centre stage but there’s also a vast array of games that are designed to suit all Canadian player’s tastes and preferences. The team at MobileSlotsCanada.biz took a closer look at what Spin Casino has to offer, and discovered that when it comes to online and mobile gaming, this casino has got it all covered. Spin Casino features more than 500 casino games, a phenomenal amount by any standards. The number of games optimised for enjoyment on mobile is obviously far smaller, but the selection keeps on growing. With the focus falling on slots there are hundreds of reel spinning games for Canadian players to enjoy. Classic reel, pub style fruities, video slots, MegaSpin slots and progressive jackpot games are all ready and waiting to make you a winner. At Spin Casino you can play top titles such as Thunderstruck, Avalon II, The dark Knight, Mega Moolah or Burning Desire, and each game offers something special. Roulette, Blackjack, Baccarat and other casino classics are all on offer too, along with an abundance of Video Poker games. Scratchcards, Keno, Virtual Racing and other exciting options can also be enjoyed at this top rated Canadian casino. Spin Casino runs on software provided by Microgaming, the worlds leading online casino brand. Microgaming has become an industry giant and the games that they produce are always world class. If you play on Android or an iPhone or iPad you can download the free app, or if you prefer, can access optimised casino games I browser. No download mobile casino games are also available for Blackberry and Windows mobile users, ensuring almost every platform is covered. Players who prefer computer-based gaming also have the option of instant play and downloadable software. Spin Casino has clearly made players safety one of their top priorities and this is evident in the state-of-the-art data encryption technology that’s been implemented. The casino has also been awarded the eCOGRA Safe and Fair Seal of Approval, along with a license by the Malta Gaming Authority, proving that the highest standards of gaming are always observed and maintained. In keeping with offering a secure gaming experience, Spin Casino has aligned itself with payment processors that are trustworthy and reliable. Deposits and withdrawals can be conducted using major credit cards such as Visa or MasterCard, Ewallets like Neteller or Skrill and other reliable banking mechanisms. CAD is supported, meaning that Canadians can transact and play in their own currency. If support is required, players in Canada are able to contact the casino any time of the day or night via live chat, toll free telephone or email. Spin Casino rewards its players well, beginning with a Deposit Match bonus that extends beyond the initial deposit. Thereafter regular rewards are on offer, and if you choose Spin Casino as your preferred gaming destination you could stand in line for daily bonuses. Players are informed of bespoke daily bonuses that are based on their gaming activity via email or when logging in to the casino software. There’s also the tiered Spin Casino loyalty group where players can work their way up from Blue to Prive status, earning increasingly valuable rewards along the way. MobileSlotsCanada.biz happily recommends Spin Casino to players in Canada and firmly believes that this casino offers a premium entertainment experience, on computer or mobile.